But, I didn’t have any chicken on hand and meat has been really expensive lately, so I decided to try to make a vegetarian version… and I ended up changing it quite a bit in the process (what else is new?). Anyway, my version is still super scrumptious, very filling, and relies on beans and corn to help fill out the pasta. The pasta cooks right in a delicious mix of vegetable broth, green chiles, and spices to make the whole dish packed with flavor, not to mention really easy (one skillet!). Sour cream is stirred in at the end to make everything rich and indulgent, then just a little cheese is sprinkled on top. I went light on the cheese, cuz that’s been hella expensive lately, too. Oh man… I just realized that a diced up avocado would be awesome on this. If you have extra cash, get an avocado! Do it! 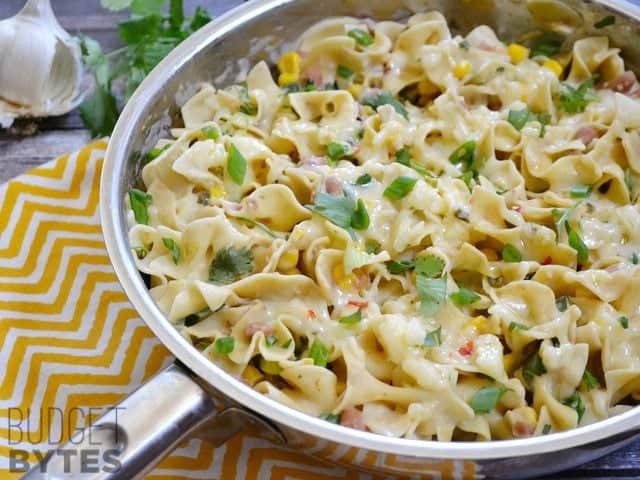 This super creamy and flavorful Vegetarian Enchilada Pasta is super fast and uses only one skillet for easy clean up! Mince the garlic and sauté it in a skillet with olive oil over medium-low heat for 2-3 minutes, or until soft and fragrant. 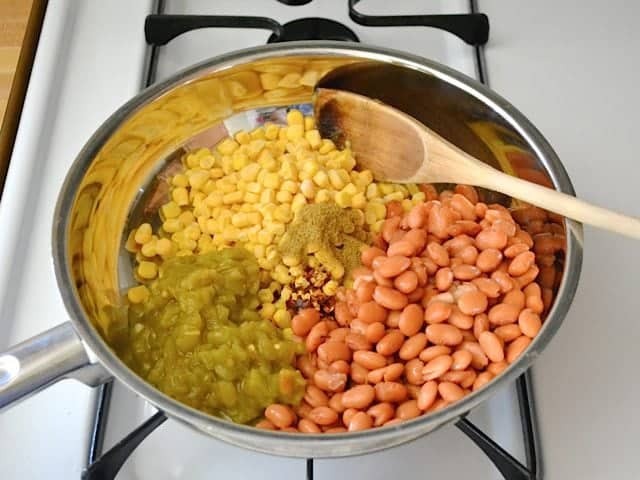 Add the can of green chiles (with juices), frozen corn kernels, can of beans (rinsed and drained), cumin, and red pepper to the skillet. Stir well. Add the uncooked pasta and vegetable broth to the skillet. The broth will not fully cover the noodles. Place a lid on the skillet, turn the heat up to high, and allow the liquid to come up to a full boil. Once it reaches a boil, turn the heat down to low and let the skillet simmer for 10 minutes, stirring well half way through. While the skillet is simmering, slice the green onions, roughly chop the cilantro, and shred the cheese. After ten minutes of simmering, the noodles should be tender and most of the liquid absorbed. Stir the skillet well, then add the sour cream and stir until it has fully coated the pasta. Stir in most of the sliced green onions and cilantro, reserving a little to sprinkle over top. Sprinkle the shredded cheese over the skillet, place the lid back on top, and let the residual heat melt the cheese. 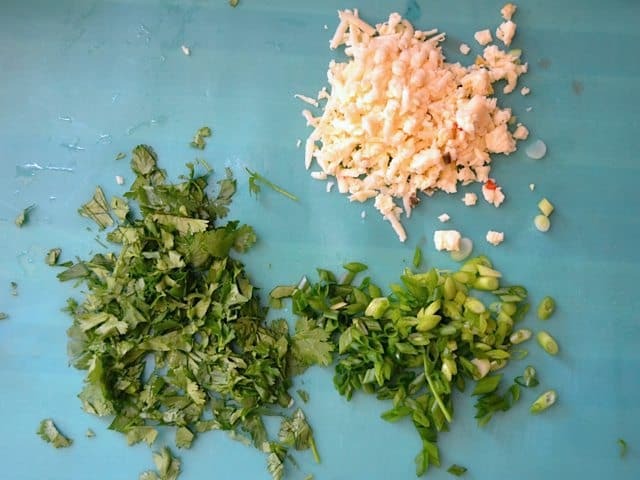 Once melted, add the remaining green onions and cilantro to the top of the pasta. Serve hot. 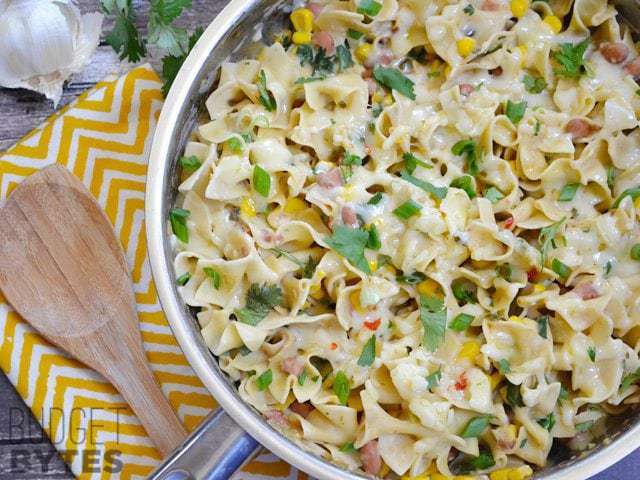 Egg noodles are thin and light allowing them to cook easily in this skillet dish, even when not fully covered by liquid. Other conventional types of pasta may not cook as easily. 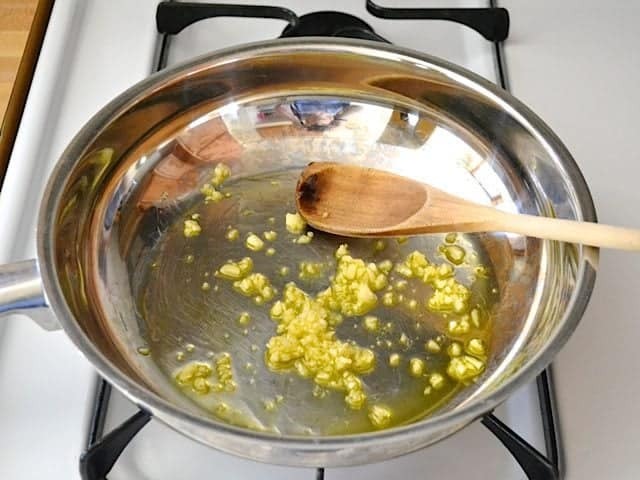 Begin my mincing two cloves of garlic, then sautéing them in one tablespoon of olive oil over medium-low heat for 2-3 minutes, or until the garlic is soft and fragrant. Next, add one 4-oz. can of diced green chiles, 1 cup of frozen corn kernels (no need to thaw them), one 15-oz can of beans (pinto or black beans, rinsed and drained), 1 tsp of cumin, and 1/4 tsp red pepper flakes (less if you’re sensitive to heat). Stir these ingredients together well. Add 8 oz. uncooked wide egg noodles and 2 cups of vegetable broth to the skillet. The broth will not cover the noodles, but that’s okay. 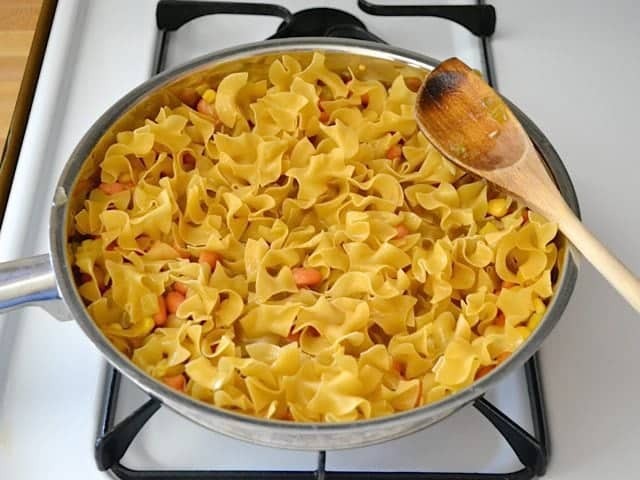 While it’s simmering with the lid on, the steam will cook the upper noodles while the lower noodles simmer in the broth. Place the lid on the skillet, turn the heat up to high, and let it come to a boil. Once it reaches a full boil, turn the heat down to low and let it simmer for 10 minutes. Stir it well once, half way through. While the skillet is simmering, slice three green onions, roughly chop about 1/4 bunch of cilantro, and shred about 2 oz. of pepper jack cheese. After simmering for ten minutes, the noodles should be tender and most of the liquid absorbed. Stir in 1/2 cup of sour cream. Add most of the sliced green onions and cilantro, saving just a little for the top. Lastly, sprinkle the cheese over top, place the lid back on the skillet for a few minutes, and let the residual heat melt the cheese. Sprinkle the remaining cilantro and green onion over top, then serve. What would you recommend serving with this? Would white beans work here? It’s what I have on hand. Thanks! I’m not a vegetarian so I was surprised at how tasty this came out when I made it. Avocados are cheap here in California so I can use them as you recommended. How many would you recommend? I assume it would be to sprinkle on the top of each plate before serving, correct? Yep, I would just sprinkle them over top. One would probably be sufficient. Thanx. I made this and it came out great. Real comfort food. Mmmm…. Hello! 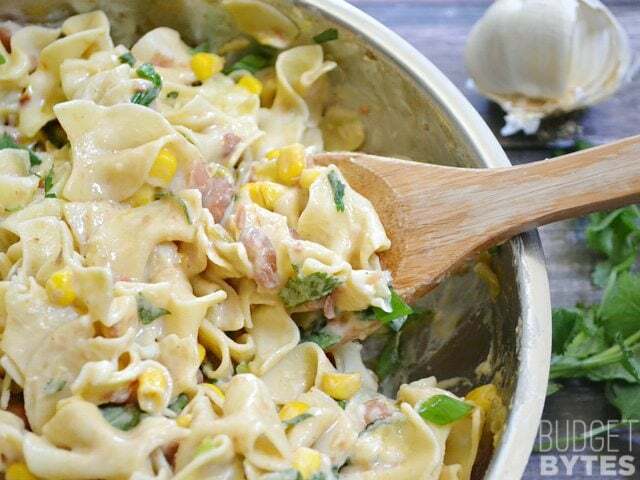 Wanting to make this but there’s a couple ingredients I can’t find here in Australia. Could I swap the green chiles for green capsicum? And if yes, how much capsicum? Also, the pepper jack cheese, I can’t find that here, would chedder work? Unfortunately the green chiles taste quite a bit different than green capsicum, so I don’t think that swap would work. Cheddar would work with this, but you’d be missing the spicy peppers that are in pepper jack. You could try also adding a pinch of red pepper flakes to make up for it. I cook my pasta separately, since I find the leftovers turn gluey and it’s just me, eating. 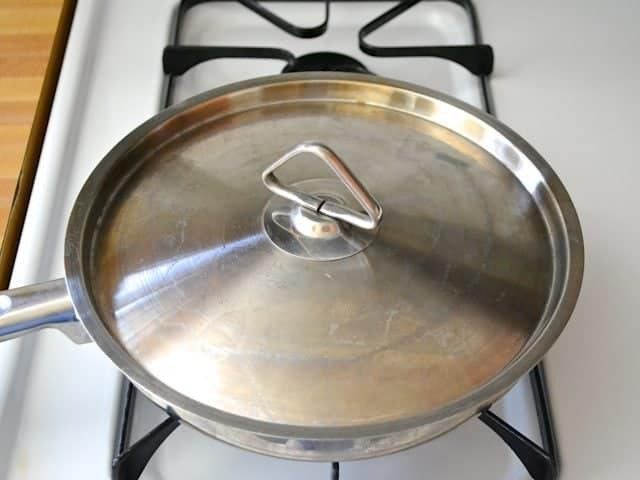 For several people, cooking the noodles in the same pot…works fine. I use Greek Yogurt, too…it just adds a little “something”. I like this recipe and have made it several times. Wow. 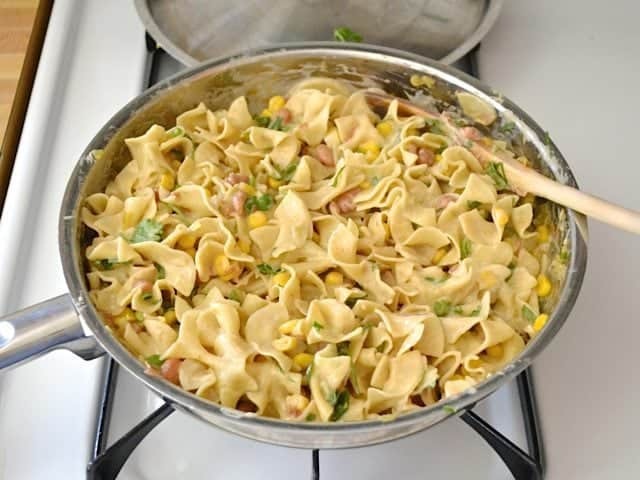 I couldn’t wrap around how pinto beans, corn, and noodles could taste good together but I followed the recipe, it was easy to make, and the flavor is out of control amazing. It’s like a southwest vegetarian stroganoff. Thank you for sharing this. I will be making this frequently. Mmm so good! One of the best recipes I’ve tried on the Internet, and so cheap too! I made it for the first time yesterday and today I just had to make it again. I added some leftover fire roasted tomatoes, salsa, and hot sauce. This will definitely be in my regular rotation of meals for the week. This is so, so good. it’s become a staple recipe that we eat just about every week. It’s fast, delicious, and I almost always have all the ingredients around. Just about everything I’ve made from this site has been very, very good but this one is our absolute fave. I have made this before exactly according to the recipe and thought it was awesome, but this time I added hamburger and salsa, omitted the cilantro and green onion (since I didn’t have any), and put in a diced tomato instead. I also cooked the noodles in homemade beef broth left over from a previously made beef stew. I kept everything else the same. It was unbelievably delicious this way. Thanks for a great base recipe!!! 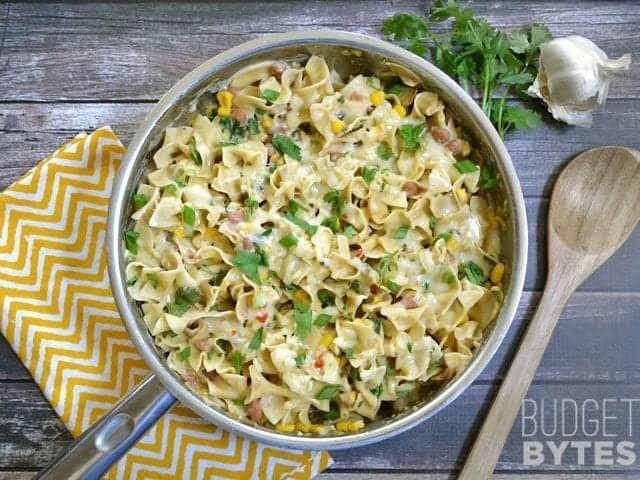 I was super excited when I found this recipe because with the exception of the cilantro and green onion I already had all the ingredients on hand so it was super budget friendly for me. (I omitted those two ingredients to save a trip to the store, but I’m sure they make the dish much more flavorful.) I’m a meat lover I was very impressed with how satisfying this dish was! I will definitely be making this one again it was delicious. This recipe was delicious! I did need more noodles since I cook for 6, but I just added green enchilada sauce to the broth to cook the noodles. The kids were (literally) licking their plates clean. HAHAHA! Thank you so much for the wonderful recipe.